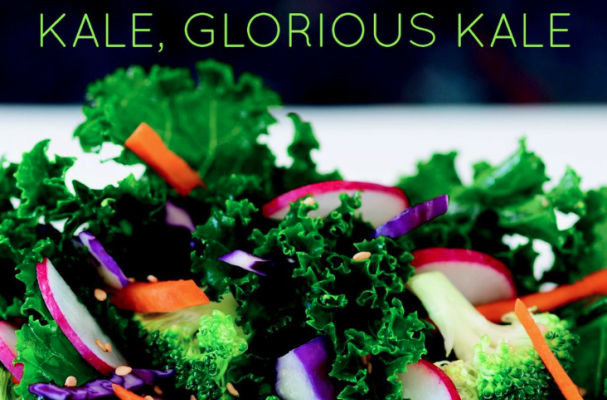 Kale is a rockstar in the vegetable world and the new cookbook Kale, Glorious Kale by Catherine Walthers is a tribute to the superfood. In the last decade, kale has gone from garnish to the main squeeze; it's the star in soups, salads, side dishes and even plays a role in the chef d'oeuvre. In the book, recipes like baked eggs over kale, pork braised with kale and cider, kale and potato latkes and bourbon apple butternut squash soup with roasted kale show how versatile this dark leafy green can be. If you've ever wondered how to incorporate more of this healthy food into your diet, this cookbook is a good place to start. 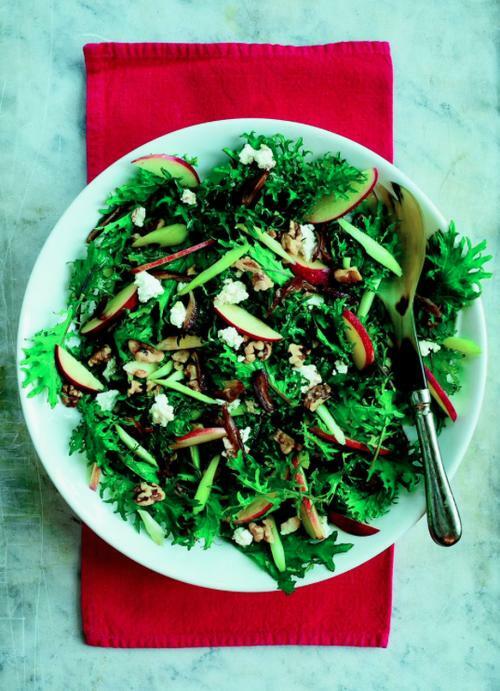 This salad works best with the tender baby kale, now available at many farmers’ markets and in supermarkets labeled as “baby kale”—usually in the clear plastic boxes. Use juicy orange slices instead of apples in the winter for a variation, or omit the apples when making in the spring or summer. Place the baby kale in a wide serving bowl or platter. Cut the dates, lengthwise, into very thin strips, and place in a small separate bowl. Peel the celery and cut in half lengthwise. With your knife at a diagonal angle, cut very thin, 1- to 2-inch pieces of celery. Add to the dates. Slice the sides off the apple and cut those pieces into very thin slices. Squeeze lemon juice over the apple slices, to keep them from browning. Make the dressing: In a small bowl, whisk together the vinegar, maple syrup and olive oil. Season with two pinches of salt and a few grinds of pepper. Just before serving, pour most of the dressing over the salad and toss to combine; pour the rest over the celery and dates. Top with the date mixture, apple slices, walnuts and feta cheese. Cook’s Note: Some feta cheese has little flavor, surprisingly. But the French sheep’s milk feta is usually flavorful, as is the Greek feta that is a combination of sheep’s and goat’s milk. Excerpted from Kale, Glorious Kale © 2014 by Catherine Walthers. Photos © Alison Shaw. Reproduced by permission of Countryman Press, a division of W.W. Norton & Company, Inc. All rights reserved.